Graphene membranes that mimic photosynthesis to produce hydrogen by harvesting solar energy could be developed following the discovery of a new effect. 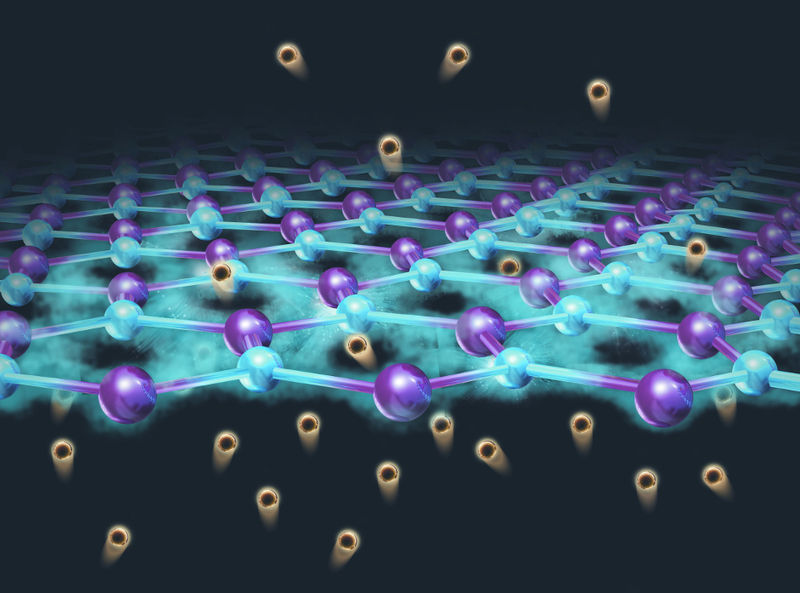 Researchers at Manchester University have discovered that the rate at which graphene conducts protons increases 10 fold when it is illuminated with sunlight. Dubbed the “photo-proton” effect, the finding could lead to graphene membranes being used to produce hydrogen from artificial photosynthesis, as well as for light-induced water splitting, photo-catalysis and in photodetectors. Graphene – a one atom-thick sheet of carbon – is already known to be an extremely good conductor of electrons, and can absorb light of all wavelengths. But it has also recently been found to be permeable to thermal protons, the nuclei of hydrogen atoms. To discover how light affects the behaviour of these protons, the researchers fabricated graphene membranes and decorated them on one side with platinum nanoparticles. When they illuminated the membrane with sunlight, they found the proton conductivity increased by 10 times, according to Dr Marcelo Lozada-Hidalgo, who led the research alongside Prof Sir Andre Geim. What’s more, when the researchers measured the photoresponsivity of the membrane using electrical measurements and mass spectrometry, they discovered that around 5,000 hydrogen molecules were being formed in response to every light particle. Existing photovoltaic devices need thousands of photons to produce a single hydrogen molecule. “To put this in context, people have been developing silicon photodiodes for the best part of 50 years, while we did not expect this material to be responsive to light in the first place, and found that it outperforms pretty much everything that is out there,” said Lozada-Hidalgo. The researchers have published their findings in Nature Nanotechnology. They now plan to investigate the addition of catalysts to the membrane, to enable it to split water molecules. This would allow it to act as a complete artificial leaf, said Lozada-Hidalgo. This looks like very promising research. Now all we (engineers) have to do is work out how best to use it. And then convince politicians that it can be used cost effectively to help our energy balance. Knowing the engineering knowledge of our political elite and their advisers this may not be easy. With appropriate continued research, this could be a way of producing hydrogen at a comparatively low price, making it an attractive alternative to oil or electricity for transport and other energy hungry uses. Hopefully it would make the huge investment needed if electricity stays the favourite among the politicians and news media completely unnecessary. I find this of extreme interest, especially when I have been seeking the best, most nearly perfect proton conduit. Very important result. It is the ‘advisers’ that are the most dangerous, like any bureaucrat their first and foremost aim is self preservation and self aggrandizement. Stuff the true science or anyone else’s career. My idea of photosynthesis is it takes in CO2 , which is “bad” in some circumstances, and gives out oxygen, good in certain circumstances. An antidote to internal combustion engines etc. This article focus more on hydrogen production. Am I awry? Layman but crucially interested.